Juergen Lossau's full colour cine magazine 'smallformat' has been published for several years now. It was launched without enough subscribers to guarantee its long term survival and was therefore a bit of a risk by the publishers. It was hoped that distribution would increase as time went by as film collectors and film makers discovered the magazine. In this regard it has been incredibly successful but despite gaining thousands of subscribers we are told just 200 more are required to guarantee the long term future of this excellent journal. 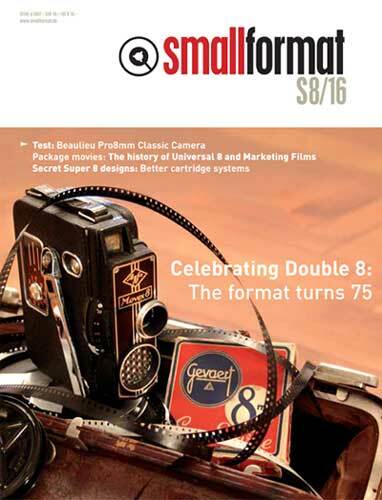 So if you are not yet a subscriber then please go to smallformat's web site and complete the Subcription section. There is also a pdf subscription for online only readers (US $ 30/Euro 24.95). NEW: There is now a pdf subscription for on-line only readers (US $ 30/Euro 24.95).